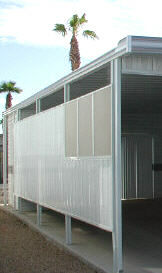 An aluminum privacy panel is a great way to partially enclose a patio or carport. Aluminum offers years of maintenance free protection for your vehicles or privacy from the neighbors. For this type of aluminum we will be using the support of your existing patio cover posts. You will start by attaching the 1 1/2" painted clips to the support posts. You will need to install support tubes at the top, center and bottom. Determine the height of your top clip and start there. If you are using 6' panels you would come down 3' and install you center clip. The bottom of the bottom clip should be set at 6' and 3/4" from the top of the top clip. This extra 3/4" will make sense later on. You will need to attach all of the clips in this way. Always measure from the top down to make your marks for the clips. The top of the awning should be level where the ground may not be. The support tubes will need to be installed next. Measure each opening individually for the best results. They are attached to the painted clips with 1/2" screws. The aluminum J-channel is next to get installed. This will go up both sides and across the bottom. Leave the top open at this time. This will get capped with Z-bar after the panels are installed. Starting at either end the panels are next to be installed. One edge of the panel will go into the J-channel. The bottom will also rest in the J-channel. It is important to use a level on the first panel before screwing it into place. If you start with the first one level the rest will fall into place and it will look straight when you are finished. Attach each panel with six screws. Use two at the top, two in the middle and two at the bottom. You should use 1/2" painted screws for securing the panels. The panels interlock and you need to be sure each one is firmly locked into the previous one before setting the first screw. The Z-bar across the top is the last piece to be installed. Use your painted screws for this also. The Z-bar overlaps and no special cuts are needed to make it look nice. Aluminum privacy panels are 16" wide and come in lengths of 6' or 12'. Privacy panel heights can vary depending on your needs. The panels are easy to cut with tin snips so a 12' length would give you 6 - 2' pieces or 3-4' pieces. You get the idea, make the best use of your material for as little waist as possible. 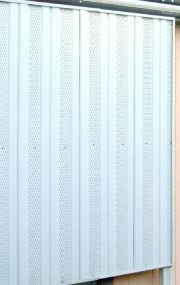 Aluminum privacy panels can be ordered in either smooth or embossed in either white or neutral. You also have the choice of solid or vented. The vented panels are very popular as they let a little air flow through while still giving you plenty of privacy. The support tubes can be ordered in white and neutral also. Be sure and match your paneling color with your tube color. The tubes are available in 8', 9', 10', and 12' lengths. They are easily cut with a hack saw or a skill saw and a plywood blade. Take careful measurements of the distance between your patio cover posts and order the next size bigger tubes. 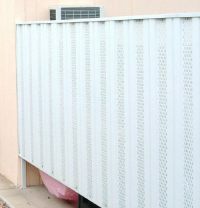 If you would like this type of privacy panel in the Mesa Arizona area give us a call.